Razer Blade combines power and portability - is it a gamer’s dream? The Razer Blade has one aim: to pack the power of a dedicated gaming laptop into the body of an Ultrabook. It's actually thinner than Apple's world-conquering Macbook Air at its thickest point at only 16.8mm deep, but as it's also half a kilo heavier at 1.88kg, it feels a lot bulkier overall. 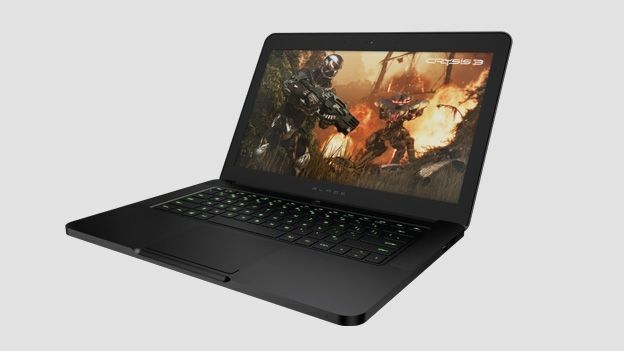 However, next to equivalent PC gaming laptops such as the latest Alienware 14, the Razer Blade is way more compact - 50 per cent thinner and nearly a kilogram lighter. Amazingly, it also matches the Alienware 14 when it comes to specs, with an Intel Core i7-4702HQ Quad Core processor, 8GB of RAM, and the latest generation Nvidia GTX 765M graphics. Translation: it's light enough to use as an everyday laptop, but it'll still play graphically intensive titles like Crysis 3. The Razer Blade is a 14-inch laptop that's 345mm wide, 235mm deep, 16.8mm high. That's thin - thinner than the Macbook Air at its thickest point, although it feels less portable than Apple's laptop as it's half a kilo heavier at 1.88kg. The more favourable comparison is against a traditional gaming laptop like the Alienware 14-the Blade houses broadly the same specifications as the 14, but in a case that's half as thick and nearly one kilogram lighter. Razer has clearly looked to Apple when designing the Blade-the case and keyboard are both similar to the black Macbook circa 2011, which is a complement in our eyes. Sadly though, Razer couldn't resist lighting the keyboard in that gaudy green colour that seems to be a prerequisite for all gaming PCs. The bottom of the chassis also gets very hot while gaming, so you'll want to use it on a desk where possible. The Razer Blade's compact size means that the connections are not as comprehensive as you'd see on a full-size laptop. The three USB 3.0 ports should be enough to connect most devices for work or play, and there's an HDMI out port for connecting to a TV or monitor. The 150W power brick is relatively small, but it doesn't attach to the computer magnetically, so it could be a tripping hazard. Finally, there's a headphone socket and a Kensington security lock. That's your lot, though; there's no wired network port, no optical drive, and no SD card slot, but their omission clearly helped keep the unit thin. Razer's wireless technology is also lagging behind, being 802.11n speed, rather than 802.11ac as is becoming standard in late-2013. The 1.3 megapixel camera is also somewhat underspecified compared to the 2.0 megapixel model on the Alienware 14. The standard Razer Blade comes with a 128GB SSD drive for storage, but our review model came with the 256GB drive option, which costs $200 extra. We'd definitely recommend the upgrade or buying a small and dependable external drive for gaming, as most titles weigh in at around 10-20GB these days, while Max Payne 3 is a colossal 29GB. The Razer Blade's 1,600 x 900 pixel screen is its single biggest weakness. Everything about the screen is below-par, from the resolution to the limited viewing angle, to the poor brightness and contrast. There are much better screens available on much cheaper laptops, and in this price category is the 13-inch Macbook Pro with Retina Display, which absolutely destroys the Razer Blade in terms of screen quality. The Dolby Home Theater stereo speakers fare much better, packing a decent amount of bass and range. Razer's keyboard boasts well-spaced keys that are satisfying to type on. The keys themselves feature a stylised, Razer-style font that could be clearer to read, at least at first glance. The trackpad is good for general use, but it doesn't click down, which is a small annoyance, and it's not the most precise model we've used on a laptop. For gaming, you'll definitely want to connect a mouse or gamepad. The Razer Blade boasts cutting-edge hardware that's powerful enough to run today's games with plenty of effects. The Intel Core i7-4702HQ processor is over-specified for most games right now, and is fast enough for video and photo editing as well. The Nvidia GTX 765M isn't the fastest mobile graphics processor available right now, but it's not far off. It'll run most games like Tomb Raider and Bioshock Infinite at mid-to-high settings, and demanding titles like Crysis 3 at low-to-mid settings. The battery life is particularly impressive at over six hours for general use, although gaming hammers it down to only an hour. Razer's ability to combine performance with portability has to be applauded. This is a computer that can play even the most demanding games, while being thin and light enough to use as an everyday laptop. Its understated design also means its a gaming laptop that doesn't scream “geek” if you're using it in the boardroom. The screen quality is the Blade's major letdown, and is way below the quality available on competitors in this price range. The Razer Edge is really the only Ultraportable high-end gaming laptop around right now, but it's worth bearing in mind what else is available. The Alienware 14 offers a very similar level of power at a much lower price, while the Macbook Pro 13-inch with Retina Display has a much better screen (although it won't play many games). For now, the Blade is an expensive luxury, but one that's still an attractive proposition for gamers. Razer Blade vs Asus ROG Zephyrus M: which is the ultimate gaming laptop?